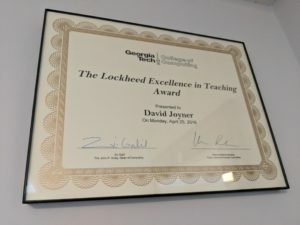 I’ve won the Lockheed Excellence in Teaching Award! 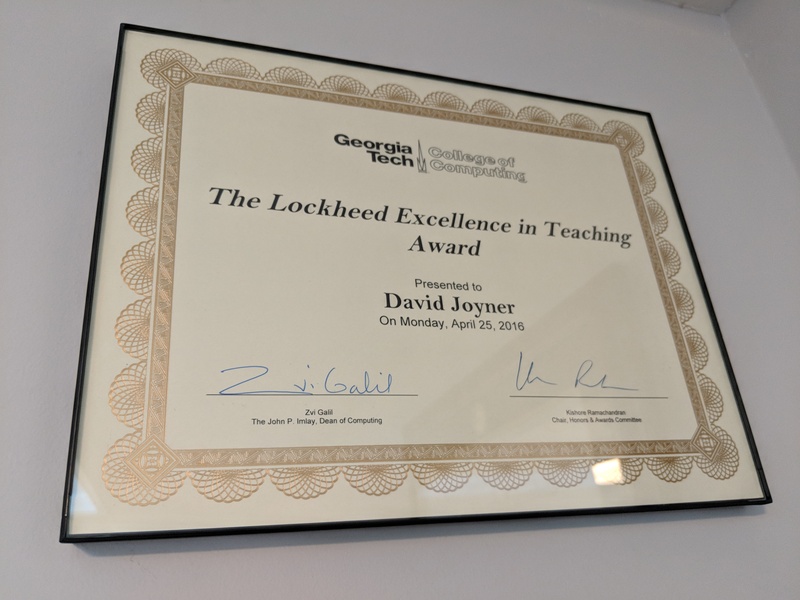 I learned yesterday that I’ve been selected as this year’s recipient for the Georgia Tech College of Computing Lockheed Excellence in Teaching Award. The award recognizes outstanding untenured educators. Recipients are selected for extraordinary effectiveness in classroom teaching, educational innovations, inspiration transmitted to students, direct impact and involvement with students, and impact on the postgraduate success of students. Thank you to Ashok, the College of Computing, and the Georgia Tech OMSCS TAs and students! I’m honored to win, and even more thrilled to see the OMSCS recognized as a place where teaching excellence can thrive. Dr. Joyner is one of the best instructors I’ve ever encountered, on campus or off. Congratulations on a very well deserved award! Congratulations! You deserve it. Not only was KBAI excellent but you were open for any ways to make it even better. BTW, I work for Lockheed. I wish I could say I had something to do with this but I didn’t know about it until now. Previous Previous post: Joining C21U! Next Next post: I’ve won the 2016 College of Computing Dissertation Award!